Meet Etsuko, one of our BridgeEnglish students in Denver, Colorado. She is from Japan and is studying Academic English. Here, she tells us about her experiences with Bridge and her time in Denver. Can you tell us about yourself? Where are you from and what do you do? Hello!! I’m Etsuko. I’m from Japan. I graduated from college in 2010 and started working as a salesperson for a pharmaceutical company. I came to Denver as a trainee of my company’s studying English program. Why did you decide to study in at BridgeEnglish in Denver? My company chose Bridge through an agent. 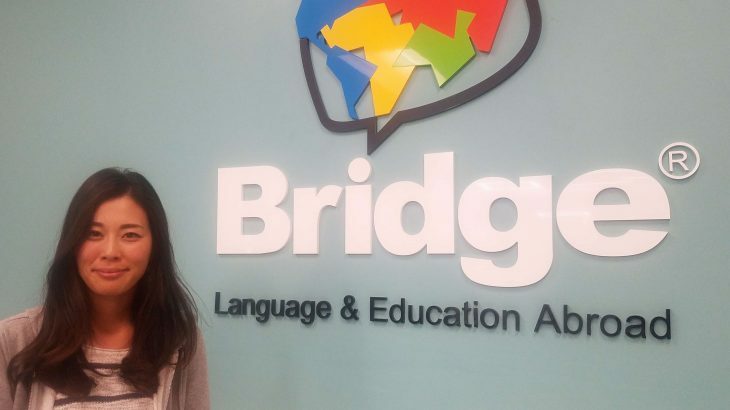 What do you like most about studying English at Bridge? What I like the most about learning English here is speaking it because I could learn not only English but also different cultures and thoughts from other country’s students speaking. I have also learned many slang words and idioms through conversations, it is very interesting to me. I also like writing. Writing was the hardest part for me when I came here. I wrote many essays in class. I learned many things about English academic writing. Personally, the most difficult thing is reading. Actually, I’m not good at reading even in Japanese, that’s why it is a hard part for me. My teacher gave us homework that is a report after reading a book. It gave me an opportunity to start reading an English book. If I didn’t have this opportunity, I would have never tried it. I’m staying with a host family and roommate. They are wonderful. My host mother always makes delicious dinners! She has a dog and sometimes takes care of her friend’s dogs. My roommate is from Panama and is also a Bridge student. My house is always fun! Yes, I would recommend! Bridge has good English lessons which fit your purpose. There are three courses which are general, academic and business English. And there are excellent teachers to teach us English according to our course. Bridge teachers and staff are like our family. They support us all of our time in Colorado. I’m really enjoying Colorado! Many students say that they miss my country’s foods. Fortunately, there are many Japanese and Asian restaurants in Colorado! There is also a Japanese grocery store downtown and its close to Bridge. I like watching and playing sports, that’s why Colorado has been a lot of fun for me! Bridge has many school activities such as watching sports games, going on picnics, movie and karaoke nights, etc. I always enjoy it! I like beer. Colorado has many good breweries. I am enjoying finding my favorite beer. I will go back to my company and work speaking English. BridgeEnglish students come from all over the world to study in Denver, Colorado. Check out this interview with another student, Erjola, from Albania!